Even by the recent standards of the Carmel City Council, last Tuesday’s council meeting was a wonder, an illustration of what can happen when the lawyers are running things. If you are tired of reading about the saga of Carmel City Attorney Glen Mozingo, you should stop right here. This has been going on for months and months now and, yes, it should not have consumed this much time and energy. But here we are. Anyway, a recap is required. I wish I could make it simpler. The big item on the executive session part of the council agenda Tuesday was a decision on whether to appeal a successful public records lawsuit I had filed against the city. Voices had published several of my articles about problems with Mozingo’s resumé – errors, omissions and exaggerations. The council then met with Mozingo behind closed doors in June so he could show them some paperwork intended to support things he had claimed on his resumé, such as the Congressional Gold Medal that he didn’t really win. Despite some resumé entries that simply cannot be reconciled, the council announced it was fully satisfied by what Mozingo had displayed. I did the natural thing. I sent in a public records request for the materials he had presented via Poweroint. I was turned down even though the law was clearly on my side. I sued, and a couple weeks ago, Judge Robert O’Farrell ruled in my favor. The issue last week was whether the city would appeal. It turns out that since Mozingo’s hiring, the Carmel council has been routinely making decisions in closed session without reporting them publicly. And council members, essentially bullied by Mozingo, have not been allowed to explain themselves to their constituents. 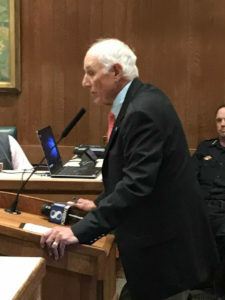 After some 90 minutes, the council emerged from closed session and Deputy City Attorney Jon Giffen announced that they had decided not to appeal. Mayor Steve Dallas started moving ahead with other parts of the meeting but I butted in to ask for a breakdown of the vote, as required by the Brown Act, California’s open meeting law. Giffen is a lawyer in private practice locally. He was hired by Mozingo as one of two deputies. For decades the city was represented by one part-time city attorney. Mozingo decided that the city needed three attorneys and, the way he’s handling things, it looks like he might unfortunately be right. Giffen also does significant work for the Fort Ord Reuse Authority, a bureaucratic nightmare of an agency governed by a board of city council members and the like from all over the Peninsula. You would think he would have a good working knowledge of state open meetings law. Giffen, however, responded to my interruption by saying that the city was not required to provide a breakdown of the vote. (I and others wanted to know the breakdown because three council members are up for re-election and the public should know how they voted on this expensive and important issue). I left the meeting to write my story but two members of the audience, retired dentist Hugo Ferlito and council candidate Jeff Baron, butted in again when Ferlito found the portion of state law requiring disclosure of the vote. That set off a flurry of discussions behind closed doors, a half hour or so worth of talk and reading of an online version of the law. To me, that’s another executive session but Council Member Carolyn Hardy, Mozingo’s principal advocate on the council, later corrected me via email. She said it was only a bathroom break. The public cannot be blamed for expecting better. The Tuesday meeting was so confusing that some, myself included, initially thought the 4-1 vote merely signified agreement with Giffen’s mistaken understanding of the law. Ferlito, the fellow who came up with the statute that had somehow eluded the lawyers, said later he planned to send the city a bill. The law says that elected or appointed officials who attend executive sessions are not allowed to disclose discussions that occur in those meetings. It does, however, require that certain votes be broken down in public and does NOT prohibit or even discourage officials from explaining why they voted the way they did, according to a half dozen California city attorneys contacted by Voices. At stake here is not whether or not Councilman Richards is ever allowed to say why he voted against that motion. 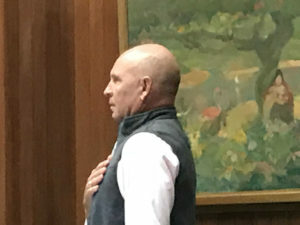 The public knows that he has become sort of a lone wolf on the council, starting with his dissenting vote against extending Mozingo’s contract for five years. When it comes to issues surrounding Mozingo and his expensive contract, Richards wears a white hat. What is at stake is the way Carmel government is run in the future considering that it receives its legal advice from lawyers who apparently are not up to speed on state public meetings law, which is considered the most basic of responsibilities for public agency lawyers. Mozingo claimed on his resumé to have done significant legal work for several Southern California cities, but I was unable to verify any of that. He claimed to have worked on a major redevelopment project for the city of San Diego and to have worked as special counsel for the Los Angeles police chief, but none of that could be verified either. Josh Geller, a deputy city attorney in Los Angeles, has a particularly liberal view of what council members can disclose – a view that recognizes that the lawyers work for the council and not the other way around. “In my experience, council members can say whatever they want, whenever they want, even after their attorney has advised them of the legal parameters,” said Geller, who also helps manage the union that represents deputy city attorneys in Los Angeles. David Laredo, city attorney in Pacific Grove, offered an opinion slightly less broad and he made it clear it is his own, not his city’s. “So long as an official does not reveal confidential information, and so long as an official does not report what was said by any person attending a closed session including the official’s own words, I believe an official may explain his/her perspective and values relating to a publicly reported vote, and that such expression falls within the official’s First Amendment rights,” Laredo said. Chris Callihan, Laredo’s counterpart in Salinas, says he would advise caution for any council member making a public statement on an executive-session vote. Another Southern California city attorney said council members in her jurisdiction routinely explain themselves after closed-session votes are announced. That attorney asked not to be identified by name, as did an attorney who has represented both cities and counties in California. He said that too often the attorneys set themselves up as decision-makers rather than advisers. By the way, a decision on whether the city of Carmel would appeal O’Farrell’s ruling on the public records lawsuit was delayed by lack of a final signed order from the judge, but the final order is now signed. It is now up to the city to turn over the paperwork. What is disturbing to me is the basic mis-understanding of the Brown Act. Brown Act (level 1) allows the public to know the results of a closed session vote. If unanimous, the results are obvious. If the vote is NOT UNANIMOUS, the results are subject to immediate public access. The order of business after a closed session is to report out in open session the results of the vote. To take a break from a scheduled meeting, even temporarily, and seek information on the rules regarding the Brown Act is verging on the ridiculous…if not the sublime. So how do I know this? As a six year member of the Carmel Unified School District Board of Education, and still current,, we learned the protocols and requirements of the Brown Act in the first week of service upon election. The knowledge level of the City Council regarding Public Meeting Brown Act protocols is one thing. To have 3 Attorneys advising them and not know the protocol is unacceptable. I am not sure what Hugo plans to charge for the Googled information resolving the issue, but my input and advice is free. Too many years loving the City of Carmel and all of the surrounding communities in the Carmel Unified School District. The City Attorney, and associates, need to be well versed in all of the requirements of the Brown Act. Without the required level City paid expertise, the City Council is left holding the bag. Thank you for keeping on this story. As a Carmel resident, I’m alarmed by the unprofessional behavior of the current council and Mozingo.